These homemade Chocolate Chip Cookie Ice Cream Cones are a seriously fun way to kick summer up a notch! Let me just say this straight out, I did not invent this! I saw this on Dude Foods and was completely intrigued. But while they do give a brief description of how to do it, there were a lot of details missing. So I just winged it. A few times. It was definitely a trial and error process… I tried. I errored. But that fabulous part about trial-ing and error-ing with chocolate chip cookie is that it’s a really delicious screw-up! And then, when you finally get it right, the heavens seem to shine down and the angels sing. While I did find a delicious recipe that is just about the right size to make 2 cones, you can certainly use store-bought cookie dough or your own favorite recipe. However, I do recommend either finely chopped chocolate or the mini chips. The flatter that you can roll the cookie dough, the better. I think rolling it to 1/2-inch thickness was just about perfect. You want the cookie to be done, not ooey gooey in the center. If the cookie is too gooey it will not roll and will fall apart. Working quickly out of the oven is key. 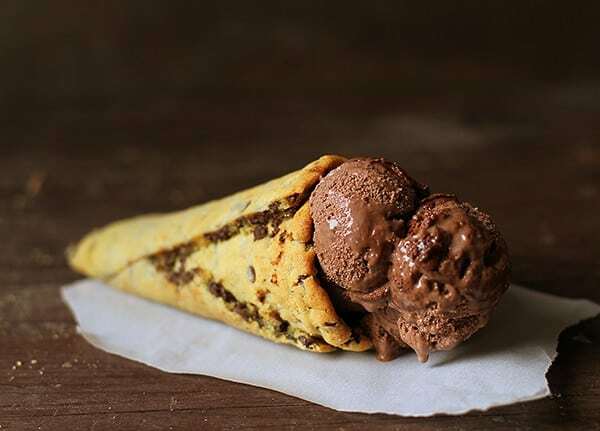 Drip-Proof Cone: If you remove the sugar cone and still want your Cookie Cone to be drip-proof, you can dip the bottom of the cone in melted chocolate and allow to cool. Or you can fill the inside with melted chocolate then set upside down to drain out and cool. You can successfully double the cookie recipe if you want to make 4 chocolate chip cookie cones, but I would still make it 2-at-a-time. These can be prepared in advance, just store in an air-tight container until ready to use. They will be good for up to a week. 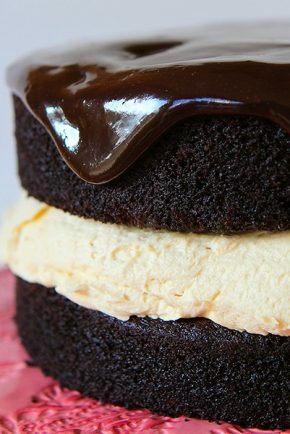 I have chocolate ice cream pictured, but I think this would be amazing with vanilla or cookie dough ice cream! Or strawberry. Or Phish Food. 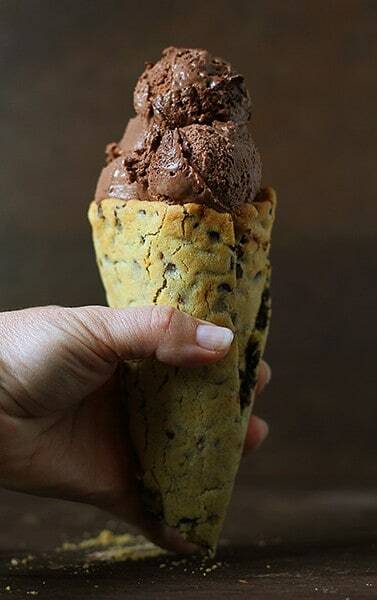 Ok, so there is basically no ice cream that wouldn’t taste amazing in this homemade cookie cone! In the bowl of a stand mixer beat butter, granulated sugar, brown sugar, and vanilla until light and fluffy. Gradually add flour, salt, and baking soda, mixing until just blended. Spread on a prepared 14-inch round pizza pan. Bake at 350°F (325 in a convection oven) for 9-13 minutes, or until center no longer appears wet and edges are just slightly browned. Immediately from the oven place two piece of parchment paper over cookie with the papers touching in the center. Using another cool cookie sheet, carefully flip giant cookie over. 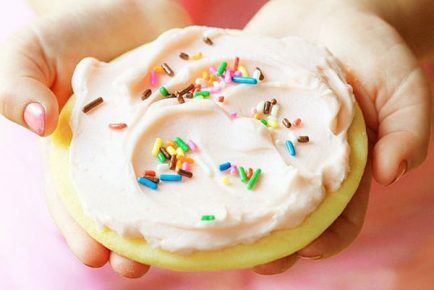 Using a pizza cutter, cut down the center of the cookie right where the parchment paper meets. Place a sugar cone along edge of cookie and start to roll it up using the parchment paper to help lift hot cookie. Roll until cone is completely covered and stop. Cut off the excess cookie. 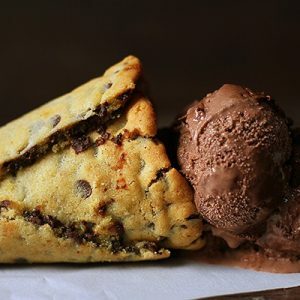 Cool chocolate chip cookie cone for at least 1 hour at room temperature or 15 minutes in the freezer. I’m straight up obsessed with this! 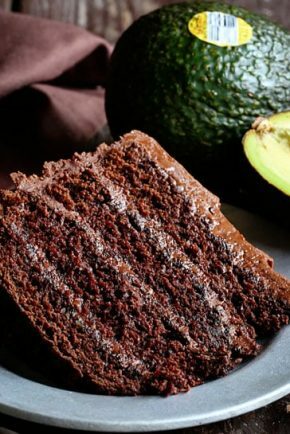 This looks incredibly delicious and amazing! OMG, I think I died and went to heaven!!!! OMGoodness this is not fair…I seriously could eat this for a meal (several actually!)! No ice cream scoop will be the same after this! Oh your cone looks amazing! I’ve seen the dudes video as well. Your tutorial is perfect! I must try this one day! And now I will be daydreaming about this all day! This is such a great idea! I need to make my own cookie cones asap! Thanks for teaching us how! This is a dream come true! Can’t wait to bake it! Thanks for the great video tutorial. OMG Amanda! What incredible decadence! Looks perfect!!! 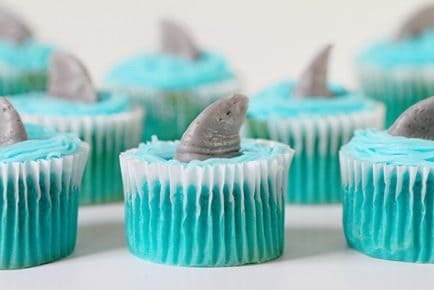 These are awesome – what a fun idea!! 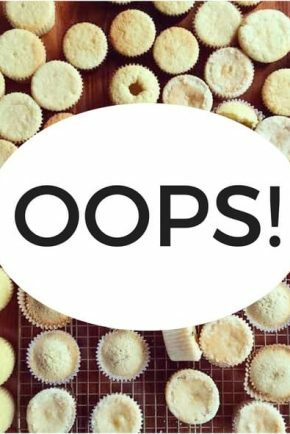 And – probably the most delicious screw-ups ever!!! You are pretty much my most favoritest person ever, even if you didn’t technically invent them! Now that’s the most amazing way to eat a scoop of ice cream that I’ve ever seen. It’s so much fun! I love it. Omg, this is the coolest thing! What a fabulous idea, and your video is so helpful!! I’m normally pretty meh about ice cream cones…but this is not your average ice cream cone. This is like a PARTY in a cone! Oh my goodness this is life-changing! What a genius idea! This is the best idea I have heard in a while! Ingenious! 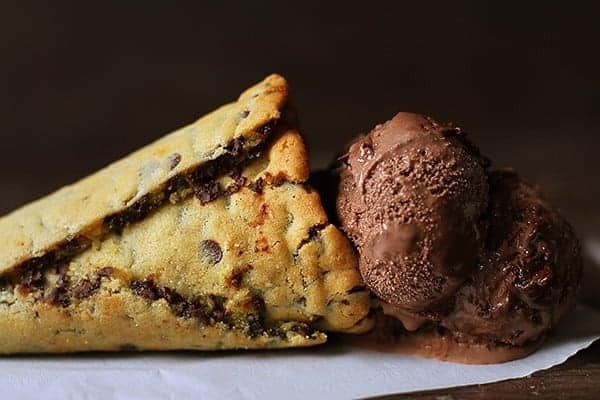 Just wondering….could you use a cone mold instead of a sugar cone to shape the cookie cone and then remove the mold once the cookie cone is cooled? Has anyone tried that? Thanks so much! 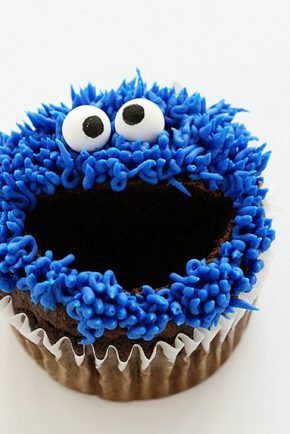 Do you make anything for diabetes? It would be nice to be able to enjoy what a reg person is eatting!